Trump’s pick for the high court responded to written questions from Democratic Sen. Sheldon Whitehouse on any gambling habits. Supreme Court nominee Brett Kavanaugh denied having a gambling problem in a questionnaire submitted to the Senate Judiciary Committee on Wednesday. Sen. Sheldon Whitehouse (D-R.I.) asked Kavanaugh a series of questions related to a publicly disclosed email from 2001 in which the judge apologized to his friend for “growing aggressive after blowing still another game of dice” on a weekend trip. Whitehouse asked Kavanaugh about his debts, whether he reported any gambling debts to the Internal Revenue Service and whether he had sought treatment for a gambling problem. “Have you ever sought treatment for a gambling addiction?” Whitehouse asked in his written inquiry. 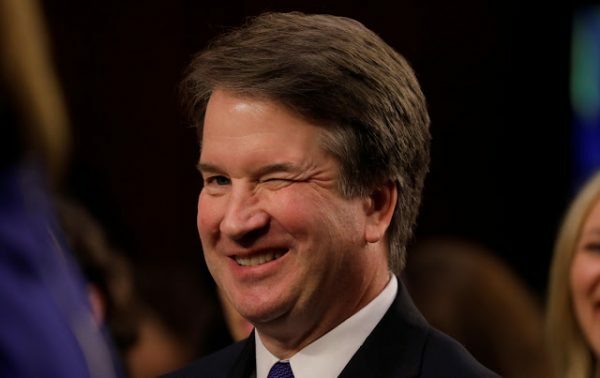 Kavanaugh’s wink tells me otherwise . It is a major addiction. Once a gambler, always a gambler.